It was an overly dull London derby as Arsenal played out a goalless draw with Chelsea, a result fans of the Blues will be happier with but one that may well have ended their Champions League ambition from the Premier League point of view. As for us, we were absent for much of the first half against a second string Chelsea. 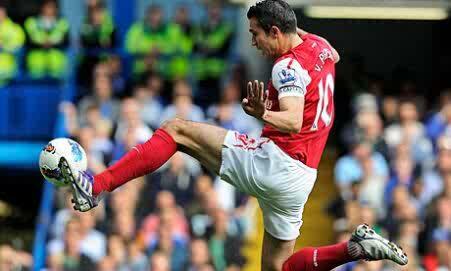 Captain van Persie hit the post (yet again) and the highly impressive Koscielny was denied by the crossbar. Assured performance from the Pole on his 50th Premier League appearance for us. Good game as well on his century of matches for Arsenal. 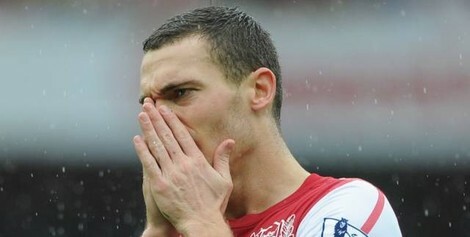 When RvP hit the post off Walcott’s freekick, Vermaelen was next to him ready to pounce. Turn the 5 upside down and add a line where necessary… you have a makeshift 9. And he defends very well too, that we all know. Sterling performance from the Frenchman, especially in the second half. Unfortunate to have the bar deny him after losing his marker well. A rock in midfield. Delivered some good balls and dispossessed the visitors on a number of occasions. He did throw a cool long ball for RvP in the second half. He however lost possession too many times, lingering on the ball when his job was to keep the game going. Was at a loss when he was substituted, then got word that he’s been ill recently. Good game from him nonetheless, felt he could have played a bit longer. Not the Ox we’ve come to love. Troubled the Chelsea back with his agility at times but brought little to the match. Went off with a hamstring injury, hopefully not a serious one. Had an average game. Let’s be honest here, our captain vantastic hasn’t been the Robin that had us no longer needing a Batman lately. Now, he’s gone over 11 hours without a goal from open play, that’s not right! Thankfully, he saw this through unlike when he came on at Liverpool. Summarily, we go six points clear with three games to play but Sp*ds and Newcastle now have two games more to play. When you do the math, today’s point is actually valuable. We just would’ve preferred three. Do share your thoughts about the outcome and its implications below. Good day wherever you’re reading this from. Tonight we come up against Wigan Athletic with a chance to open an eight point gap on the Spuds and Newcastle United. Both teams were not involved in league action over the weekend due to the FA Cup semi finals in Wembley. The weekend proved that the FA Cup still has its magic. I mean…Carroll scored a winner, how often does that happen? It was also fun to see Chelsea thump our noisy neighbours 5-1. This season they have conceded 5 goals to City, Chelsea and Arsenal. Big club mentality, you say? Quite funny how Harry Redknapp is still the “top candidate” for the England manager’s job. There were mentions of cheating from Chelsea and the win (despite the margin) was tagged controversial by ESPN. The Sp*ds lost and that’s what matters. Ashley Young alone won 2 penalties in 2 games, both undeserved and set United on the way to claiming maximum points from both games. Whether they would still have won those games without those penalties is open to debate. Onto Arsenal news, Wigan visit the Emirates brimming with commendable pride after being ‘overlooked’ to get at least a point at Chelsea before deservedly defeating league leaders Man. United in midweek. Even Fergie thinks they can win if they manage to nick a goal against us, and that’s saying a lot. Coupled with the fact that the Latics are fighting against the drop, the importance of this match is not lost on Rosicky. Rosicky is likely to return for this tie after being rested for the win at Wolves last Wednesday while Gervinho is in contention as he’s recovering from an ankle injury. Gibbs has a 50-50 chance, and following Santos’ horror defensive showing at Wolves, the Englishman should return to LB if fit. Djourou will partner Vermaelen again at the back with Koscielny serving the last of his two-match suspension. Szczesny. Sagna, Djourou, Vermaelen, Santos. Arteta, Song, Rosicky. Walcott, Benayoun/Ox, van Persie. We all would love for Oxlade-Chamberlain to get some starts but Benayoun has played well in the last two games while we all know Walcott (somehow) remains an ‘integral’ part of Le Professeur’s plans *sigh*. If we go into this in the business like manner we did last time out at Molineux, I fancy us picking a win. And having in mind that while Arsenal have won nine of the last 10 in the league, Wigan have lost just once in its last six. Final word on this post goes to Piermario Morosini, who suffered a heart attack on the pitch in Italy and died over the weekend. Our condolences extend to his family and friends in this trying period. These events put football in a different perspective. That’s all from me for now, enjoy the game wherever you watch from. I’m putting my money on a 3-0 win, to the good guys of course!